What is the Grange? I tell people that the Grange is everything we, the members, want it to be. The Grange is our extended family. This doesn’t happen in a month or a year but in years of helping our Grange and its members to become better, more rounded, better informed members of our Town, State and the Great Country we live in, the USA. I often hear people complain how hard we have it here. I know it's true, but we also have the people and the will to get things done and make it even better than before. We work together. We need to get back to basics with improvements along the way to a better path in life. Grange basics are good, but our world is changing fast. We can make a difference in our lives and show non-members how we can do this in an extended family way. We need to let people know what we are and why. Then make the changes needed to make ourselves better than before. 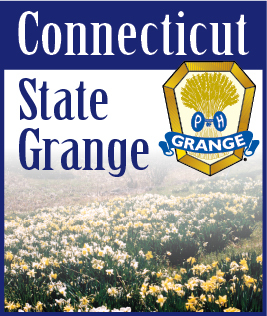 Get those information signs out along our roads and tell people what is the Grange.